Have a look at this 100 year (actually, 105-Year) chart. I colored each "Market" appropriately -- Green for Bull, and Red for Bear -- to more clearly show what happens. Bull markets get ahead of themselves. At their ends, they tend towards excesses that take a very long while to recover from. When a long Bull runs end, it takes quite a while before the next one begins. Some of this is related to the destruction of capital crashes cause; Much of it has to do with the psychological damage suffered by investors. As we have seen more recently, that damage -- plus 46 year low interest rates -- helped push former market investors into real estate. We have yet to see their unbridled love affair with sotcks rekindled. What will be the catalyst to get them back into equities? My best guess is a sustained move upwards. Regardless of the actual cause, in the past century, every Bull Market has been followed by a significant refractory period. From the looks of the time-lengths of red, it appears almost generational in nature. The damage is repaired when a new crop of investors -- without crash scars -- finally appears. 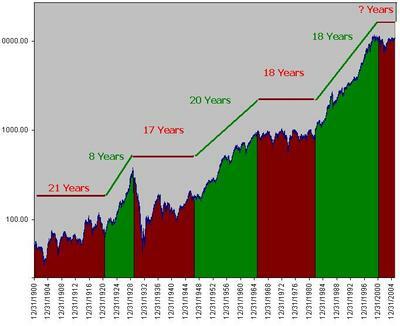 Is it possible that an 18 year Bull market (1982-2000) could be followed by a 2 1/2 year Bear (March 2000 peak to October 2002 low), and then launch into another multi-decade (2003-2018) Bull? Sure, anything is possible. But as the chart above plainly shows, it would be historically unprecedented. One other thing worth noting: The steepness of the gains from 1924-1929 are very much parallel to the 1996-2000 moonshot. Both ended with near 80% drops (Dow for 1929, Nasdaq for 2000). It took 25 years -- until 1954 -- for the Dow to regain its 1929 highs. I don't believe it will necessarily take that long for Nasdaq -- but I am aware of the outside possibility. Sources: The raw data for this comes from Stock Trader's Almanac, which Jeff Hirsch kindly provided. The concept for this was shamelessly lifted from Rydex. 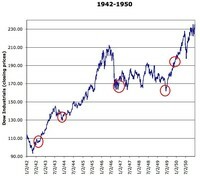 But their chart (see original here) was flawed -- I found where they delineated the post 1929 crash Bull and Bear Cycles, and the post WWII Bull, was wanting. Rydex's chart had a 25 year post-1929 Bear, followed by an 11 year post WWII Bull market. That seemed wrong, especially whent he market had been going up for much of that 1940-1946. So I adjusted the start to more clearly reveal the post WWII Bull beginning around 1946. Picking a beginning to the Bull is subjective -- you could start it from 1940, or from the 1942 low, or the 1943 high, but then it includes a major correction in 1945 -- the Dow dropped from over 211 to 163 (23% -- but not in a day, like 1987). So while I could have placed the beginning as late as 1949 or as early as 1940 or 1942/3, I somewhat arbitrarily placed the start of the Bull at 1946 . . .
Where does the Bull Market start? I'm wondering how this would look on a log scale.